What Is the Best Barrier Device for Giving CPR? What's the Best CPR Mask for Giving Mouth-to-Mouth? Masks like these are very hard to use correctly. A reader asks what the best type of CPR (cardiopulmonary resuscitation) mask a lay rescuer should use when doing mouth-to-mouth. He is concerned that a barrier device, supplied with an AED (automated external defibrillator) that he and his wife purchased for their home, would be difficult to use. He asks if one of the many other products available would be better for him and his wife to use, should they need to perform CPR. First, it's important to realize that a CPR mask, officially known as a barrier device, is for keeping you—the rescuer—safe. It doesn't make rescue breaths more effective than straight mouth-to-mouth. Also, most rescuers aren't going to give rescue breaths anyway. 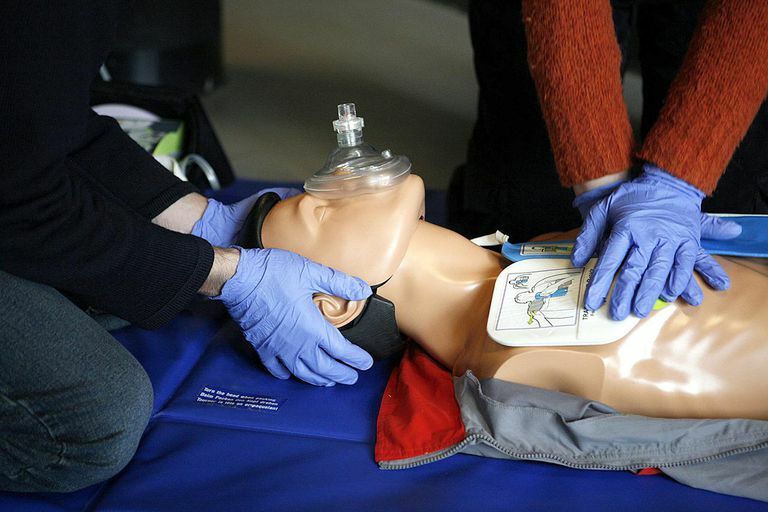 The American Heart Association no longer recommends mouth to mouth during adult CPR. For an intimate partner or immediate family member, a barrier device is almost never necessary unless the patient is known to have an infectious disease. It's probably not even necessary for performing mouth-to-mouth on a stranger in the grocery store, but we'll get to that in a moment. A barrier device is one type of personal protective equipment designed to protect rescuers from exposure to infection when in close contact with victims. HIV and the hepatitis family of viruses are carried in blood and some other body fluids. Since there is no way to know if a cardiac arrest patient is carrying these or any other communicable diseases, it's typically considered wise to use a barrier device to keep body fluids out of the rescuer's mouth during rescue breathing. A flat plastic barrier that lays across the victim's mouth and nose. It conforms to the face and allows the rescuer to blow through a hole in the middle. The hole has either a one-way valve or a filter to protect the rescuer, depending on the brand. These flat barriers are popular with lay rescuers (and off-duty professionals) because they are very portable. Most of the time, they can fold up tight and fit on a keychain. Professionals use a mask shaped like a pear that fits over the mouth and nose. With proper technique, it seals onto the face. The rescuer blows through a one-way valve at the top to provide rescue breaths. To an untrained eye, these can look like complicated devices. For most lay rescuers, a flat barrier is probably the best device on the market because of its ease of use and portability. The technique required for making a seal with mask devices is difficult to learn and very hard to master. Not having a barrier—or not knowing exactly how to use one—shouldn't keep you from performing CPR. If you call 911 and the dispatcher walks you through the steps for CPR, he or she will not even ask you to give rescue breaths until you've done 400 compressions. Only then will the dispatcher ask if you've been trained and are willing to do mouth to mouth. The dispatcher will not care if you have a barrier device. This means that if you find a stranger lying unconscious and not breathing in the middle of aisle 4 in the grocery store, you should have someone call 911 and start chest compressions, even if you don't have a barrier device at the ready. If the person down is a family member, then you probably don't need a barrier device at all. It stands to reason that if you are willing to kiss a person, then you are able to give rescue breaths without a barrier device. Time is of the essence, and searching the catch-all drawer for a mask or fumbling with the car keys for the barrier device is not doing anything to keep blood flowing to the heart and brain. All of this assumes you have actually taken a CPR class. It's a good idea to get the proper training for CPR and for whatever AED you may be expected to use. That means that if you have an AED at work, home or school, train on that model. Likewise, you should get the training to properly use whichever barrier device you are most likely to have available during an emergency. Barrier devices make it safe to perform CPR on a stranger. They even make CPR less intimate and more comfortable to perform on a loved one. Despite their functionality, barrier devices aren't necessary to do good CPR. When in doubt, call 911 and start pumping the victim's chest. Push hard, and push fast. Ewy, GA, et al. "Cardiocerebral resuscitation for cardiac arrest." Am J Med. Jan 2006. SOS-KANTO Study Group. "Cardiopulmonary resuscitation by bystanders with chest compression only (SOS-KANTO): an observational study." The Lancet. 17 Mar 2007.